What happens when people sign up for your software-as-a-service (SaaS) product? Chances are, you send them some email. Recently, I was chatting with the founder of a SaaS company about onboarding emails for SaaS companies. He wanted some new ideas on how they could improve their welcome emails. 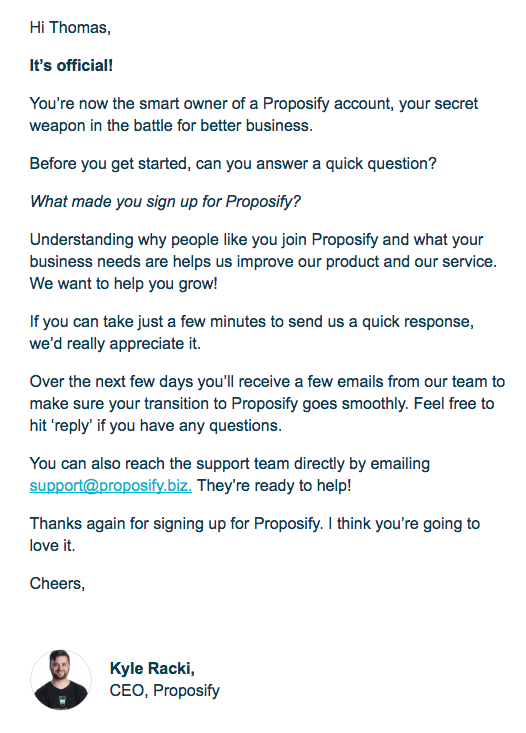 I thought to myself, how could you figure out what the fastest growing companies are sending in their welcome emails? I forgot about the idea until I came across saas1000.com, a list of the fastest growing SaaS companies globally. So, I signed up to the fast growing 618 SaaS companies using a brand new Gmail account and my phone number and website. Suffice to say, I received a LOT of emails. I analyzed and categorized all these incoming “welcome emails”. My question was simple: what are the patterns in the welcome emails these companies send? 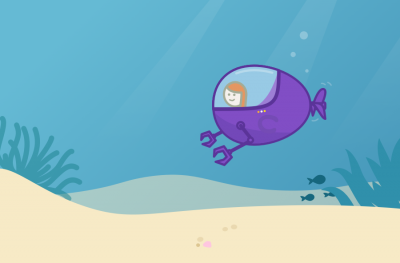 What ideas can we find that to help us send better first emails to our customers? During the experiment, I attempted to sign up to 618 different SaaS products. It was interesting to see some patterns in the process. 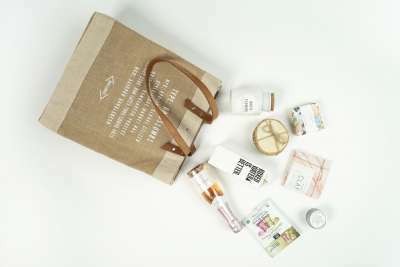 264 of the products allow me to create an account and start using their free trial straight away. 238 of the Saas products were for a product demo given by a sales rep.
82 of the websites wouldn’t let me sign up with a Gmail email address. 21 companies required a credit card during the sign-up. 12 SaaS companies required phone verification before signing up. Clearly, a self-service free trial model is dominant. However, a large chunk of SaaS products funnels new leads through a sales rep.
It’s also interesting that over a 100 companies choose to put in place barriers to sign-up such as only allowing business emails, asking for credit cards or requiring phone verification. 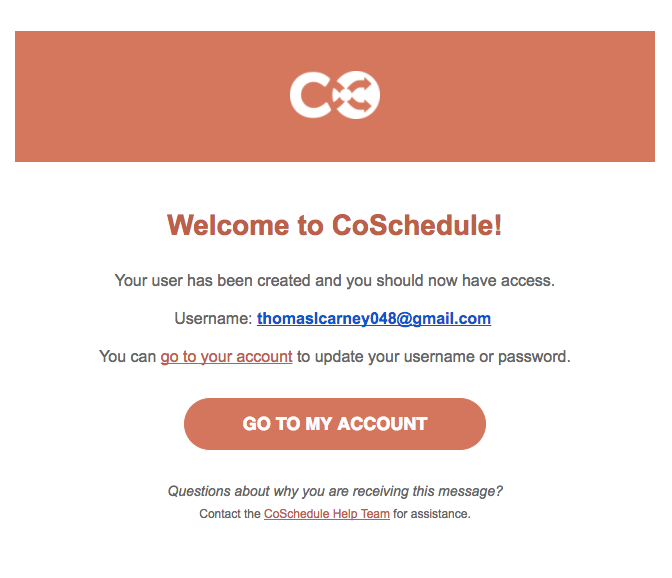 Typically, I found that these were SaaS products that had a self-service sales model: You sign up for a 30-day free trial and decide for yourself if the product is for you. For example, autopilot mixes a CTA to install the tracking code along with links to their webinars, documentation and “Flight School”. The last one – workflow apps – enable people to do work. A welcome email that helps people do that will mean you’ll be more successful. 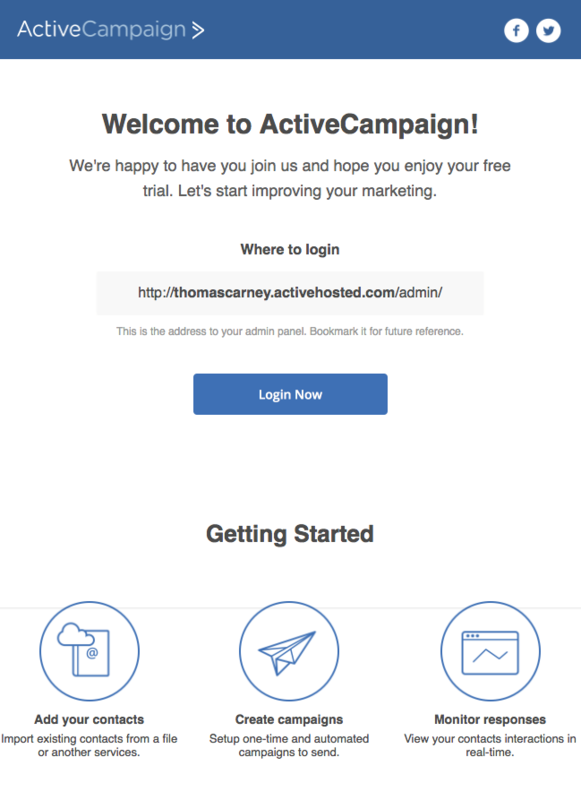 I found that a lot of SaaS products focus their first welcome email on a single CTA designed to get the user to log into the application. These short, to-the-point emails are a great option when you put your onboarding efforts into a guided tour of the app once you log in. One issue I have with the “log into your account” email is that it isn’t always clear what the next action should be. Instead, a better approach can be to focus on a specific next step. 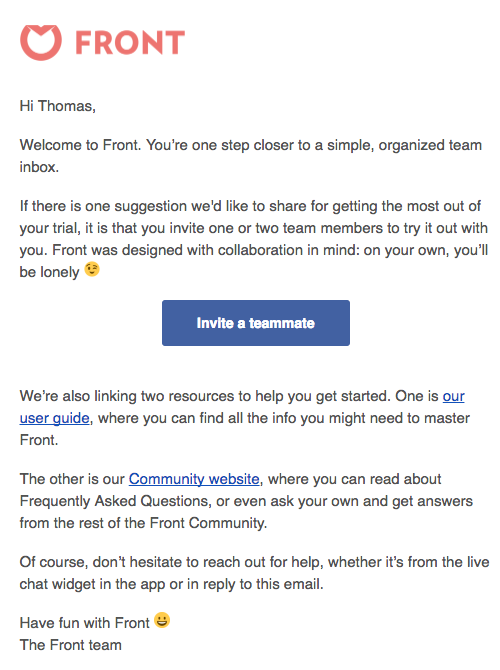 Front focuses on inviting a teammate, which makes sense as the first step for a team inbox app. They also pair it with two customer success links but give them a lower priority in the design hierarchy. 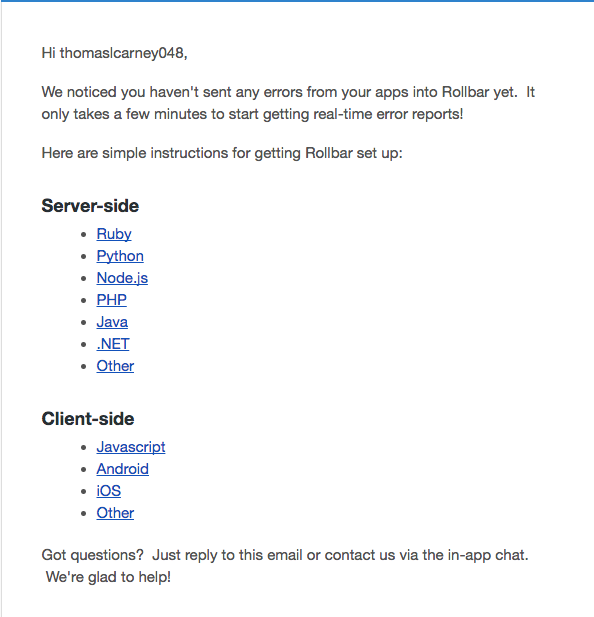 Calendly’s welcome email is super short and concise. They give you a link that you can start sharing directly with others. You can share that link, and you’ll start seeing Calendly meeting notifications popping up in your calendar. 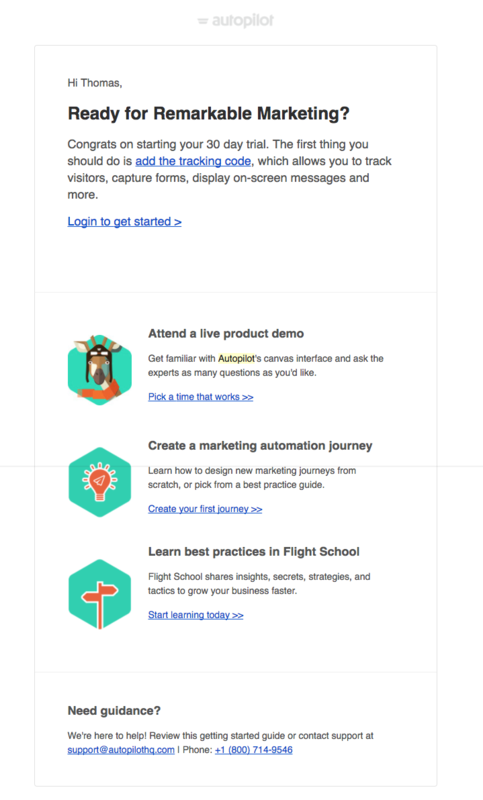 This email shows that the “next action” doesn’t always have to be something that your customers do in your SaaS product. SaaS products will often need you to install some code on your website before you start seeing value from their product. For example, an analytics app can’t show you data on your users unless you’ve installed the tracking code. Therefore, a critical piece in getting customers to the ‘Aha moment” that convinces them of the product’s value will be helping them install their code. 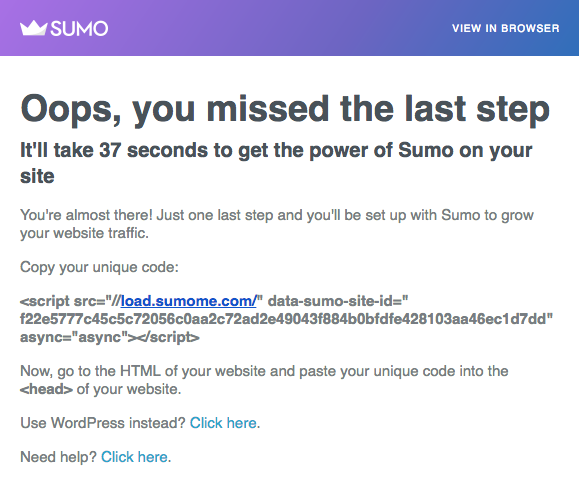 Sumo, in their typical relaxed copy style, sends a follow-up email on day two if you don’t install your code. They include the actual snippet you need to include along with two secondary CTAs to a WordPress plugin and support documentation. 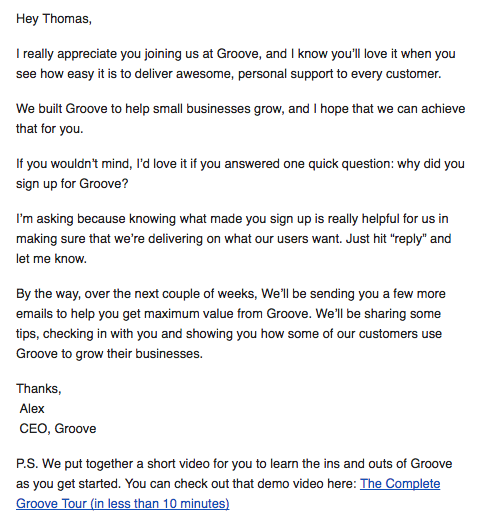 I first heard about this email from GrooveHQ. In the “CEO email”, you send a personalized email from the CEO asking people to share why they signed up your product. Alex Turnbull argues that it helps you establish a personal connection with your customers, gives you qualitative data on the drivers behind sign ups and lets you customize your high-touch emails sent by customer success reps. He also says that they get a 40% response rate to that email. Well, it turns out that they are not the only company to use this email. The CEO email is very popular. In all, I received 57 “emails from the CEO” out of around the 618 SaaS companies. From personal experience working at Plan.io, the email from the CEO was our highest performing email that received by far the most replies. It was also a great source of qualitative feedback as Alex Turnbull says. A large minority of the SaaS products funnel leads through a sales rep. That means you enter your email, name and some details on a form on the company’s website, and then a sales rep reaches out to you to schedule a call. The reason for this is that more expensive software generally requires more interaction before prospects buy. I signed up for demos at 238 companies. The majority of the companies just sent fairly short emails asking for a good time for a call or providing a link to an appointment scheduling app such as Calendly. This GIF reduces the cognitive load by showing people how easy it is to schedule a call at a time that suits them, rather than forcing them to figure out yet another appointment scheduling system. Katherine Mindigo from Miva includes a link to a landing page on how their solution drives ROI 2x faster than the industry average. 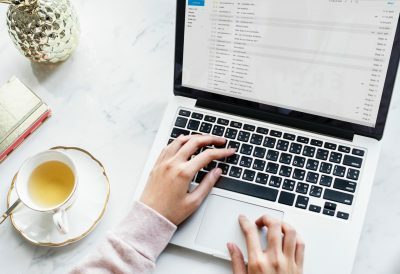 Surprisingly few sales development reps used this tactic of including customer success content such as case studies or ROI results in their emails. 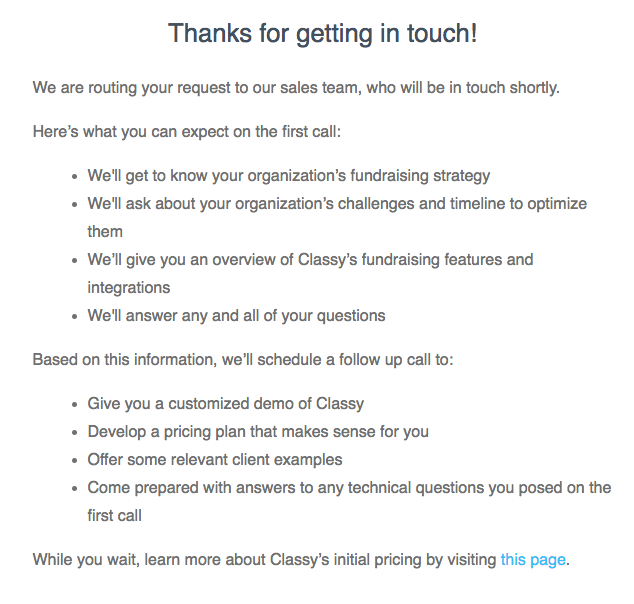 Classy immediately sends an email letting you know that you’ll hear from a sales rep soon. They also give you an overview of what you expect from the call and how the process will go from there. Finally, they add a link to find out about pricing. Classy doesn’t just stop there. 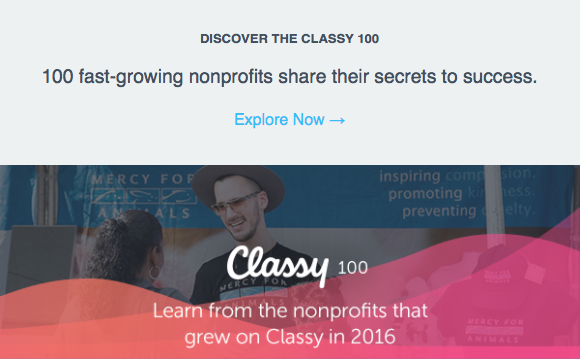 They also include a footer with a link to the Classy 100, a list of the top 100 fast-growing non-profits with insights into how they did it. 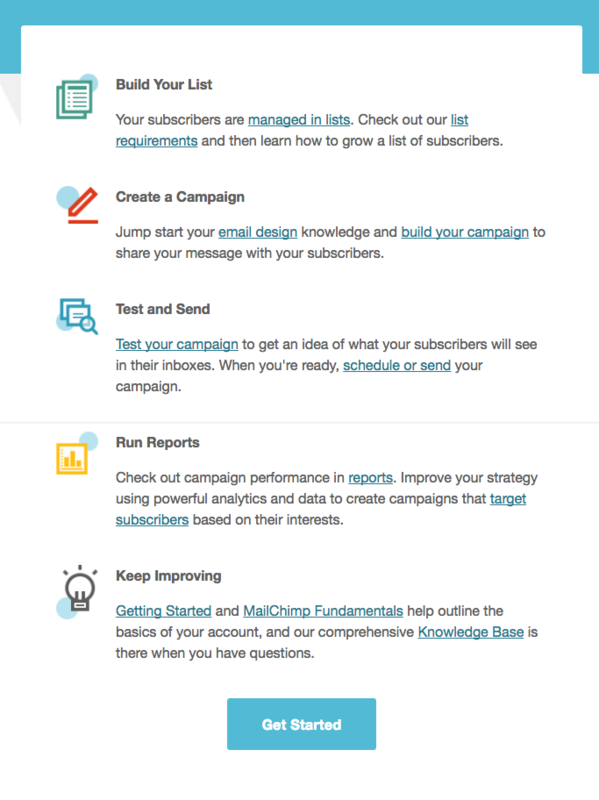 It’s clear that SaaS companies send a lot of emails as part of their sales and marketing process. If your prospects typically check out several solutions before deciding on one, bear in mind that they’ll have a very busy inbox. One side-effect of all this email is that almost 50 companies ended up in the spam folder. It’s important to make sure your emails follow best practices so you don’t end up in the spam folder. If you’re sending outreach cold emails, consider using a separate IP address and domain for those emails. At the same time, while I entered my phone number into hundreds of forms, I only received a handful of phone calls from sales reps, while those sales rep sent a lot of follow up emails asking for a time for a call. Perhaps some companies should get more comfortable with just ringing up inbound leads! 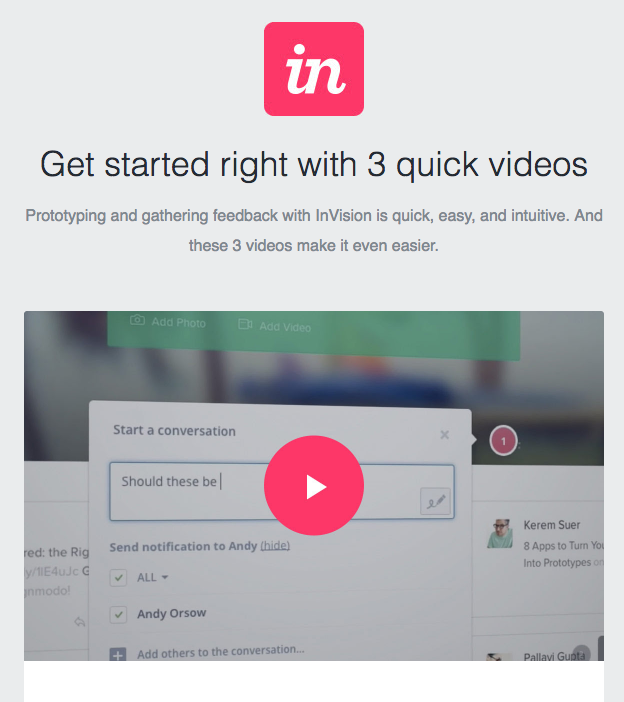 Do you have any ideas or examples of awesome welcome emails for SaaS products? Let me know in the comments below. About the Author: Thomas Carney has worked for tech companies in Munich, Paris, and now Berlin. When not on a computer, he’s at CrossFit or trying to brew the perfect coffee with an Aeropress coffee maker. He writes about marketing for SaaS products on his site.